FREE SHIPPING & NO SALES TAX! Just a little storage space makes a big difference! The 8 x 2.5 ft plastic garden shed provides that extra space you need, where you need it—in your yard. With a Lifetime plastic garden shed, there’s no more searching through the garage or the house for your favorite little garden spade. Keep rakes, hoes, and miscellaneous garden tools right at your fingertips. This Lifetime garden shed also comes with shelving and peg stripsto keep your supplies organized and easily located. Lifetime plastic garden sheds are designed for style and constructed for durability from high-density polyethylene plastic with steel reinforcements. The easy-to-clean, high-impact polyethylene flooring is resistant to stains and solvents. 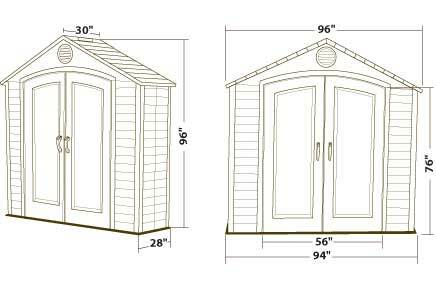 Lifetime’s attractive plastic garden sheds are very low maintenance—No Painting, No Rusting. These plastic garden sheds are UV-protected from fading and cracking and will look great for many years to come. Note: This shed must be built on a flat level foundation of wood or concrete (not included). Made in the USA.